Note: I’m doing this operation from a machine with Ubuntu 16.10 “Yakkety Yak”, but these applications should run on most current Linux distributions. 1. 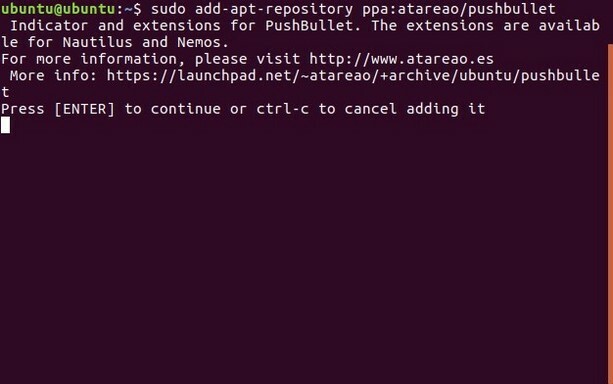 First, on your Linux desktop, open Terminal by pressing (Ctrl + Alt + T) and once there, type the command “sudo add-apt-repository ppa: atareao / pushbullet” . This will add the repository that contains the Pushbullet client for Linux to your system. 2. Then, type “sudo apt update” and wait while the system updates the repositories and performs other tasks. 3. 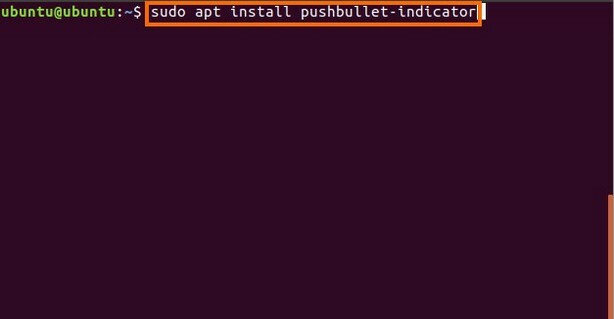 Once you have done this and see the Terminal prompt again, simply type the command “sudo apt install pushbullet-indicator” . This is a Linux client for Pushbullet and the command itself will give the command to install on your system. Now you can start the Pushbullet Indicator client (Pushbullet Indicator client) ¨ and log in to your Pushbullet account. The Linux configuration is already done. Note: The Pushbullet indicator is developed by a third party, using the Pushbullet API. Keep in mind that it is not an official application. Configuring Pushbullet on Android is really easy. You can go to the Play Store and download the Pushbullet app for your Android device. Once it has been downloaded, simply start the application and then open your session with the same account that you used to log in to your Linux desktop. The Pushbullet app will ask for a couple of permissions. Use them to access your notifications and send them to the Linux desktop. Once this is done, you should receive notifications from Android on your Linux system. AirDroid is possibly the easiest application to configure, since you do not even need a desktop application to work, you can simply log in to the AirDroid web interface and scan the QR code with the Android AirDroid application. AirDroid will allow you to do much more than just send notifications. You can use it to verify your call and message log. You can take screenshots of your Android device directly from your Linux desktop, and you can even install APKs on your device. Sounds great; but the only problem with the use of AirDroid in Linux is that, if you use Firefox, the web interface will not send notifications to your desktop and will only show them within the tab in which it is running. 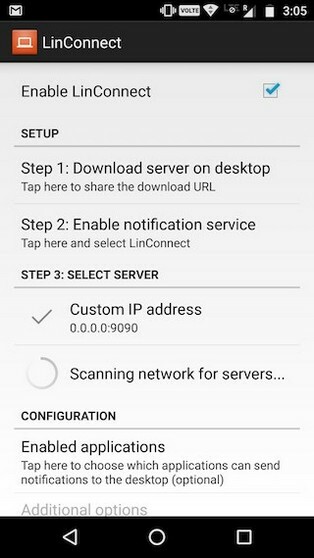 LinConnect is an Android application that you can use to view notifications from your Android device to your Linux desktop. However, to do this, you must install the LinConnect server application on your Linux machine. The instructions to install this server application are present in the file ” Readme (readme) ¨ of the GitHub application. Once you have installed the application on your Android device and the server application on your Linux desktop, you can connect your Android device to the system. Simply after doing this, it will allow you to access notifications from your Android device on your Linux desktop. 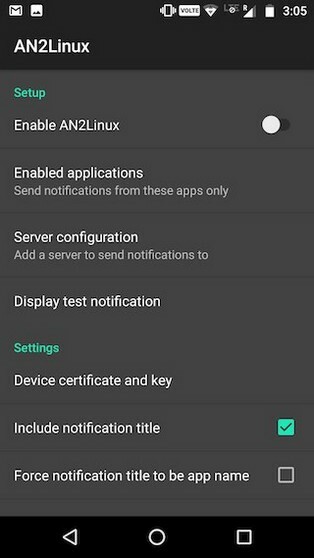 AN2Linux is another application that you can use to view notifications from your Android device on your Linux desktop. This application works the same as LinConnect, and you will have to install a server application for AN2Linux on your Linux desktop. After you have connected your Android device to the desktop, you will also start receiving notifications on your Linux system. Desktop Notifications is an Android application that takes a different approach to reflect notifications from your Android phone to a Linux desktop. Instead of having to install a server application on your desktop, you only need an extension of Google Chrome or Firefox. 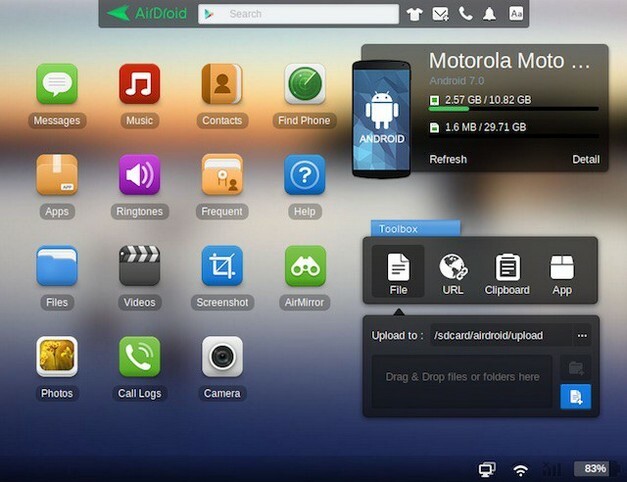 The application can send notifications from your Android device to your Linux desktop. These were some of the applications that you can use to view Android notifications on a Linux desktop. I would recommend that you try Pushbullet, because it is very easy to configure and it just works well. However, the other alternatives I propose are equally good, but somewhat more complex. You can use any of the applications mentioned in this article to reflect notifications from your Android device to a Linux desktop. However, if you know other applications that work better and are easier to configure than the ones we refer to in this article, I would appreciate it if you could comment on them.